Archery is the only (sort of) competitive sport I have done as an adult. Sure, I've picked up some weights, or played softball, or volleyball, or various other recreational type activities on occasion but I haven't pursued anything else in a manner that could be described as "organized" or "competitive". This post is about some of the things it taught me. When I first conceived of this idea I thought I would be returning from the Lancaster Archery Classic at Spooky Nook with a bunch of pictures from that tournament. Due to a series of events I did not attend this year, so we will have to settle for a picture of my target bow. The first thing I can think of that archery has taught me is a stronger faith. This is from a number of things both concrete and allegorical. A concrete example is from experiencing an arm and/or shoulder injury, I still don't know what exactly happened. It was a rough enough injury to require doctors, and physical therapy, and prescription NSAIDs and more than a year of healing time. During that year I contemplated selling any and all archery gear I had. God said he would heal it, though, and he has. Its not perfect yet, but I can easily shoot all the arrows in a typical league night now. In allegorical ways, you need a bit of faith in your form and process to shoot consistently. When shooting a bow you don't choose the exact moment to release the arrow. You draw and anchor your bow, aim, and pull on the string and push on the bow until "pop" the arrow goes. Even though your sight is moving over the target face you don't try to control it. You have to give up that control. You trust that your brain and your form will cause the bow to pop at the right time to put the arrow in middle. Well, at least I do, maybe other people can will it into the middle on their own. I can't. Archery has taught me new mechanical skills. For any of the bows I personally own I can fully set up and tune them. I can also change strings, limbs, and cams. I've learned the importance of "on equipment" documentation. My bows have silver sharpie lines, and dots on various places to either serve as quick look reference marks, or give me areas to measure from. I've also learned how to build arrows and other miscellaneous things I never would have had a chance to know otherwise. It reinforced reasonable financial habits. 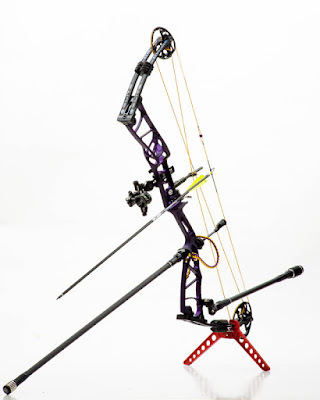 Archery gear isn't cheap, but it also doesn't have to be expensive. I started moving towards target archery from a hunting bow setup. I didn't build the full target setup at once. I started buying the gear and using it on my hunting bow. In this way I avoided rushing into buying a complete setup all at once, and was able to take time, and save the money to ensure that I only bought something once. Now I do have a target bow, with all the stuff I accumulated over a period of about 18 months on it. My hunting bow has all its own stuff back, except for a few bits that I have lent to other people. It also taught me to lighten up and have fun. I stuffed an arrow nearly off the bale during the first indoor league shoot I participated in this year. I went to let down and failed, the bow popped, and the arrow hit the top of the target, no where near the scoring rings. I think that may have flustered me in year's past, but I shook it off and put the next arrow in the middle.